One of the great additions to MSNBC’s line up is the Melissa Harris-Perry Show on weekend mornings, airing from 10am to noon Saturday and Sunday. And one thing that makes it great is the way the MHP show has engaged its audience via Twitter, even going so far as to invent their own hashtag, #nerdland (One day I’ll find out if this is a pun on Birdland). 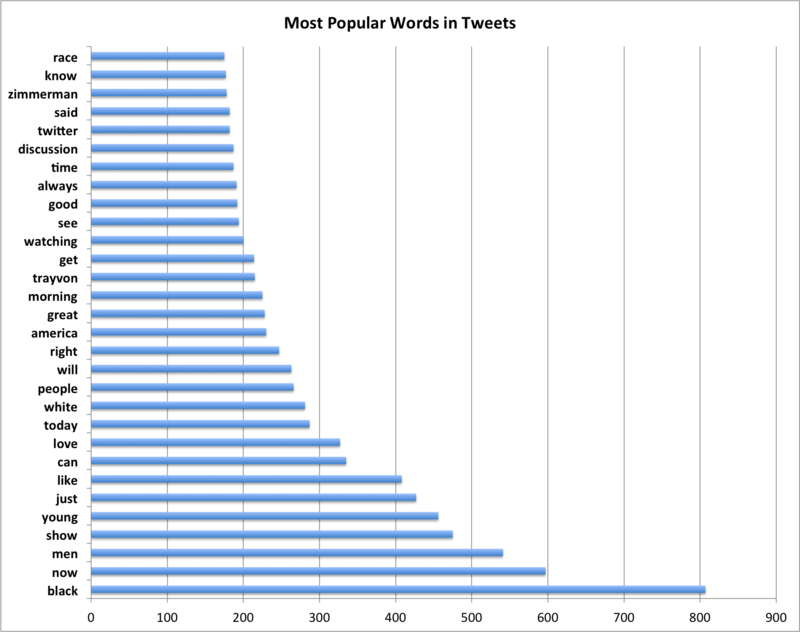 New tweets are in blue, and re-tweets are in red; over the course of the 48 hours of Saturday and Sunday, about 38% of the tweets were retweets. You can clearly see the activity building up right before the start of the show, but quickly dwindling afterwards. 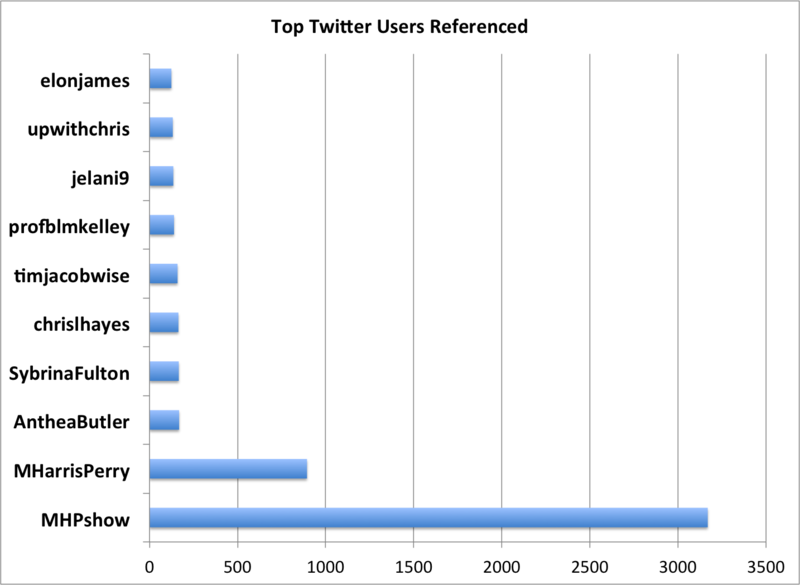 Since I included @mharrisperry references in my count, the residual activity is a combination of show related tweets and tweets to/from Melissa herself. 108 RT @MHPshow: #TrayvonMartin’s mother is now on Twitter. You can follow her at @SybrinaFulton. 47 RT @keithboykin: @MHPshow made a compelling point about Obama’s birth certificate & #Trayvon’s shooting. As blacks, we always have to prove we belong here. 30 RT @MHPshow: Now in #nerdland: Melissa talks to three black young men about growing up in today’s America. They’re joined by Dr. Jawanza Kunjufu. It’s interesting that so many of the retweets are from the show itself. But it is also interesting that these tweets represent a small fraction of the roughly 2500 retweets that took place — so it’s clear that no avalanche took place (for an example of a retweet avalanche, see my article on when the Trayvon Martin story caught fire on Twitter). 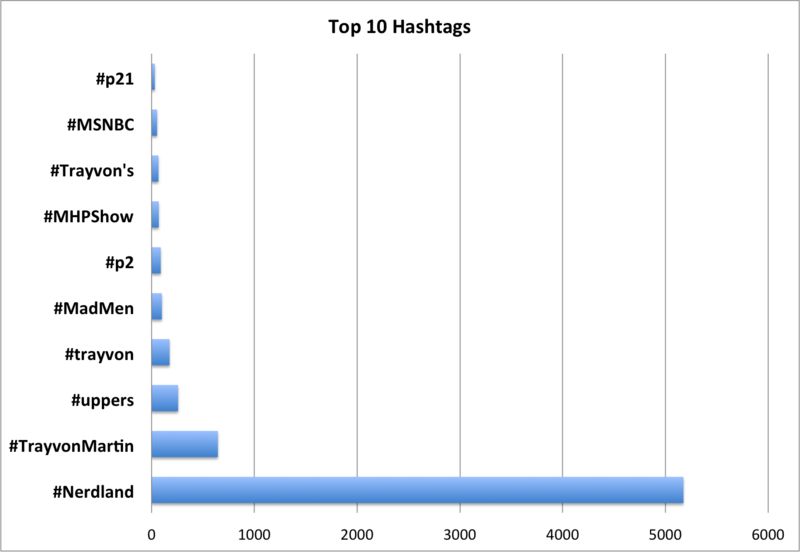 Almost everyone managed to include the #nerdland tag. So what to make of all this? 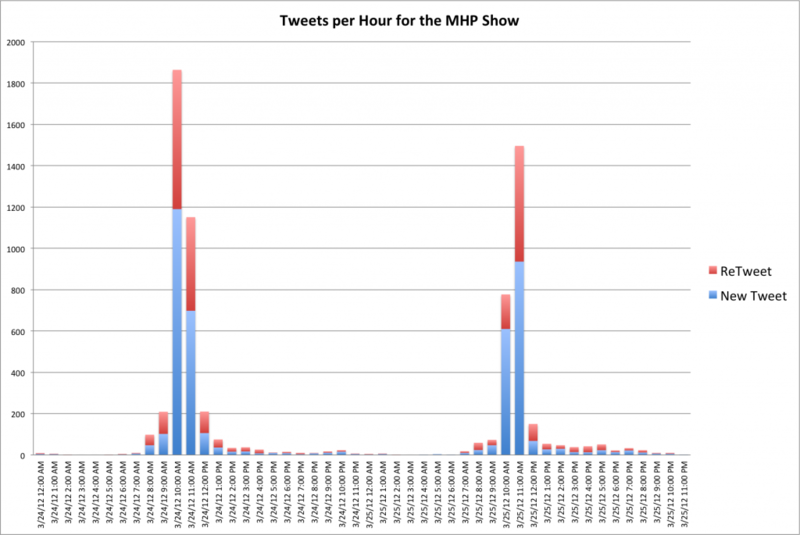 First, there’s a vibrant community of Twitter users who engage during the MHP Show, even if they disperse back to other Twitter communities when the show is not on. Second, the community is carrying on an extended conversation about the topics being discussed. Since the show itself is a discussion the majority of the time, it’s like an inner circle of conversation on the show and an outer circle of the same conversation on Twitter. It would be an interesting dynamic to have a mixing of the conversations between those two circles as the show goes on…. I’ll try to come back to the MHP show in a few months and compare the Twitter communities to get a sense of the growth and change that has taken place. I used all Tweets from 00:00 am Saturday until 11:59 pm Sunday that had either @mhpshow, #nerdland, or @mharrisperry in the tweet. This entry was posted in Cable Channels, Media, News and tagged Melissa Harris-Perry, MSNBC by Charles McGuinness. Bookmark the permalink. I’ve made a point to be on twitter while watching the show every weekend. Love seeing what others are thinking/sharing. It adds to the show, great dialogue. We need a MHP application that has the live feed on the top and the twitter stream below — that would unify the two!